Kavanagh’s Mews is a spacious 2 storey Mews House once the home of Ireland’s famous poet Patrick Kavanagh. Before its conversion into a house the Mews was a stable for a Victorian 19th century terrace Mansion on Dublin’s Pembroke road. It’s since been rebuilt and repurposed into a spacious mews house and has been recently restored and redesigned to a very high standard. It’s quietly set back with complete privacy in the former bustling literary quarter of Baggot Rath, now known as the Baggot Street area of Ballsbridge. The house is specifically designed for 6 guests who can enjoy different beautifully designed spaces. There is a large comfortable living, dining and kitchen area with a real fireplace. Then there’s the separate long TV room with a 9 seater couch system and cushions that can convert into 3 single beds with an ensuite half bath and another half bath just across the hall. Upstairs are 2 double bedrooms and the main bathroom. The decor throughout is fresh, simply white with historic reproduction feature wallpaper, touches of walnut wood and splashes of silver grey. The art is botanical to reflect the beautiful private garden at the back and the annexe courtyard to the front all private and with outdoor seating for eight. The accessories are crafted in Ireland and you’ll find an eclectic mix of books on local history, literature, food and Dublin urban wildlife. 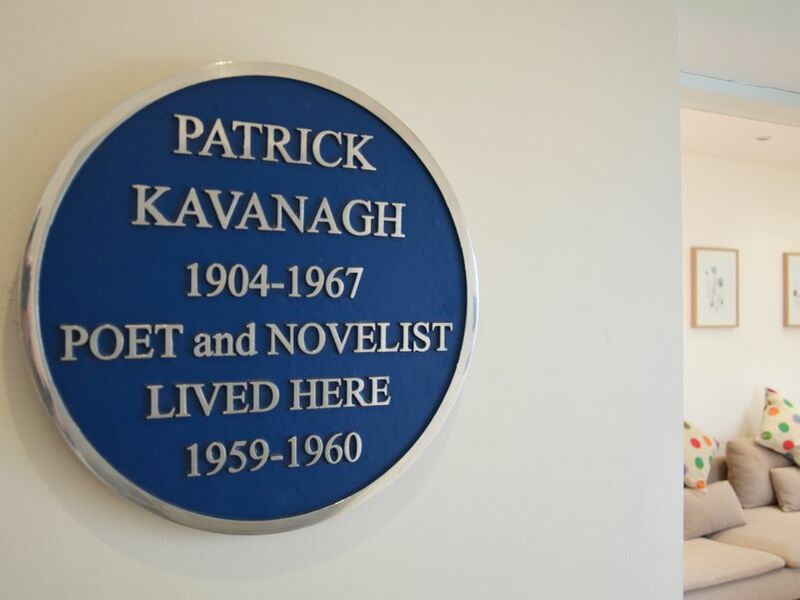 If Patrick Kavanagh was to reside here again we’re sure he’d approve of our design and would love to know that guests visiting Dublin from around the world are enjoying the beauty of what was once his home. I'm a Dubliner who loves beautiful places, spaces, music, history, art and food. I adore local places with long histories and like to get to know them. My desert island foods would be crumbly blue cheese on an oat biscuit, butter and whiskey wrapped fresh lobster and cork dry gin with slices of homegrown cucumber and ice. I cant live without good coffee and wouldn't even try. I'm currently reading Swallows and Amazons with my kids and I love it for its sense of freedom and escape. My favourite musicians are plenty - Queen, Van Morrisson, The Mumfords, Daft Punk. I believe in keeping life simple - and I fundamentally believe - the simpler, the better. This place is authentic, real and alive in its history for me because my hero poet Patrick Kavanagh once lived here ...and when he did the surroundings inspired him to write his most incredible work. In September 1959 Kavanagh took up home at this Mews...at a time during which he committed to an acceptance of life as it is. He said that 'in the final simplicity...we are satisfied with being ourselves.' During this period he wrote many poems expressing inner tranquility, several of them sonnets, and they were praised in reviews. As an example of this change in his writing Kavanagh quoted his sonnet 'Canal Bank Walk' in his self portrait: 'Leafy-with-love banks and the green waters of the canal / Pouring redemption for me, that I do .../ Grow with nature again as before I grew. ''... I like the clarity and the emotiveness of Patrick Kavanagh... I like how he combines the kind of mystic into really clear, evocative work that can make you glad you are alive.' this is how the actor Russel Crowe explains his perspective on the work of Patrick Kavanagh. Obama also quoted Kavanagh on March 14th last in a speech. His words and the place that inspired his words at that particular juncture in his life is what inspires me very day to live life simply ...for the better. What I enjoy also is the privilege of owning Kavanagh's Mews and the opportunity it has given me to meet people who want to share this space for the very same reason. Kavanagh's Mews' exterior cut limestone and granite door case, gravel under foot outdoor spaces, treelined aspect with nesting and singing birds and the authentic footprint of the house kept in tact since the time Patrick Kavanagh lived there in the 1950's is what attracted me to this haven in the first place. The back garden captures and traps heat when the sun comes out...because it's so well sheltered. there is no noise - it's tranquil and free ... and yet if you want to participate in the bustle you just need to walk out the door. It's understandable how Kavanagh was attracted to the space as a writer and its surrounding greenery - of trees, parks, canal walks and so on are an oasis in any Capital city. The bathroom has a bath come shower and a full power shower, a wc and basin and a storage cabinet. In Ballsbridge the sought after leafy area of Dublin 4 ... filled with manicured squares and parks, cosy pubs, world famed coffee baristas, canal bank markets, sports and concert stadia. extensive for cooks and dining including cookery books...or simply for takeaways. Dinnerware for 8.
child's high chairs available on request. dining for 9 indoors and out. Una's home is the best place to stay in the Ballsbridge area of Dublin. Everything is first class with great attention to detail. It is exactly as pictured and check in was easy. There is plenty of room for a family to spread out with a lovely garden in the back adding outdoor seating for dining. Also, a courtyard entrance with seating. The mews is quietly located in a very safe and convenient location. Just steps from the nicest restaurants and shops in the area. She leaves the prettiest basket full of goodies upon arrival. Everything you will need for breakfast the next morning and some snacks for later. There is even milk and butter in the refrigerator and a well stocked pantry. Very lovely and personal gesture. We were completely happy there and anticipate that you would be too. Very comfortable and spacious apartment in a quiet area close to most attractions. Communication was excellent. We stayed in the Mews for three nights and it was lovely. Una left us a basket with bread, granola, marmalade, porridge, and tea, and milk and butter in the fridge; we happily ate breakfast in the flat every day. The place was clean and quiet aside from neighborhood sounds (and seagulls, which I don't mind). Being in a neighborhood brings you closer to the spirit of Dublin, much better than being isolated with other tourists at a hotel. The beds were also clean and comfortable. Two tips for American visitors: one, bring your own washclothes, they're not a thing in Ireland or the UK; and two, there is a binder on the book/printer table under the stairs that tells you how to turn on the hot water, among other things. READ IT. We took cold showers for two days because we didn't read the instructions! Overall, would absolutely stay here again. Love the location and the history of the house and Una (and her dad) are lovely. Very comfortable. Pleasant area. Loved the basket of fruit and other goodies. Thank you for letting us enjoy your home for a week. Before long we began to think of the Mews as home. We had the good fortune to spend two weeks in July at Kavanagh Mews in the heart of Dublin. The convenient location offered walking distance to great restaurants, pubs, the local grocery, other shops, and best of all a leafy path along the canal. Most remarkable was that the Mews was on a quiet lane away from all the noises you'd expect to hear in a big city. While there, our Irish relatives joined us for home cooked meals prepared in the well equipped kitchen and enjoyed around the backyard table. We took the train or light rail for day trips to the shore, and enjoyed a driving free vacation. When our plane tickets indicated it was time to go, it wasn't easy leaving our Dublin home behind. We loved the beautifully and comfortably decorated Mews apartment. It is close to shops (1 min walk) and city centre sights (15 min walk). The space is beautiful inside and out (even a nice patio in back and one in front; comfortable dining/ sitting and “chill out” rooms. The “starter” goodies— milk, coffee, butter, marmalade, and more— were so wonderful! We would love to visit again. Thank you Una and Barry! This is a two storey recently refurbished comfortable and relaxing mews house loved by Homeaway guests. The mews was a coach house for a large victorian house on Pembroke Road in the 1800’s. It's a special charming house, which was once home to Ireland’s famous poet - Patrick Kavanagh. Kavanagh composed the poem Raglan Road which was adopted in song by Van Morrison among many other musicians and singers. The Mews is on Baggot Lane, in Ballsbridge which is Ireland’s leafy embassy belt set among Georgian and Victorian Dublin. This mews house is one of the few which has some of its original coach house features from its first occupants in tact. It is also one of the few buildings of historical and literary interest available for short term stays in Dublin. The Mews has been decorated to take account of its victorian past and its mid 20th century occupancy by Patrick Kavanagh, in style, furnishings and design while keeping it fresh and modern. Just on the doorstep are the banks of the Grand Canal, Herbert Park or Merrion and Fitzwilliam Squares... all of which are an oasis of calm and still greenness in the city centre which inspired the writing of Kavanagh and which are within easy walking access if you stay here. If you like rugby the Aviva stadium is a some minutes walk away which hosts the international nations and provincial rugby and has a series of concerts also. The RDS showgrounds nearby is famous for its annual horse show. Also within walking distance is Trinity College where you can view the Book of Kells and see the Brian Boru Harp. The National Library where you can view the national archives of writing and photographs is also very close as is the Genealogy Office for checking out Irish ancestry. There's lots to do like taking a picnic in the local parks or on the banks of the canal, playing tennis in Herbert Park enjoying award winning pubs, cafes and local restaurants. Why not take a food or literary trail, visit the local Bord Gais and Gaiety Theatres or catch a lunchtime concert in the National Concert Hall. Just a few stops on the DART train you can visit Sandymount Strand, Dunlaoire Harbour and Howth - catch some sailing, surfing or kayaking...there's plenty of choice. Transport and Getting Around is easy: Nearest Taxi Rank - 1 minute walk - Nearest Air Coach Stop: 10 minute walk -Nearest D.A.R.T station - 8 minutes Walk - Nearest Dublin Bike Station - 11 minute walk - Nearest Bus Stop is 2 minutes walk - with 5 routes. Second nearest bus stop is 7 minutes walk with a further 3 routes. What are we Near? - Airport - 25 minutes away by Taxi (depending traffic and the time of day) Luxury 24 hour service AirCoach’s Ballsbridge Hotel stop is a 3 minute walk away. Theatres and Concert and Sporting Venues: - Aviva Stadium - 5 minute walk - RDS Main Arena - 10 minute walk - Bord Gáis Energy Theatre - 15 minute walk - National Concert Hall - 20 minute walk - Gaiety Theatre - 20 minute walk - O2 Arena - 25 minute walk - Andrews Lane Theatre - 20 minute walk - Olympia Theatre - 30 minute walk- Abbey and Gate Theatres - 40 minute walk. Museums and Galleries: - National Museum of Ireland and Natural History Museum of Ireland - 20 minute walk - The Little Museum of Dublin - 20 minute walk- National Gallery - 20 minute walk. Shopping, Eating and Drinking: - St Mary’s Road, Baggot Street Upper, Merrion Row, St. Stephen’s Green, Grafton Street have plenty of restaurants and world famous bars within easy distance. Searsons and The Waterloo gastro pubs of literary and rugby fame are just within 5 minutes walk. If you prefer to dine in - there is a supermarket, fine grocery and wine shop within 5 minutes walk and a Canal Bank food market with artisan food producers every thursday about 8 minutes walk away. - Royal Canal - 10 minute walk - Grand Canal dock and quay - 13 minute walk - Phoenix Park - 10 minute bus or Luas ride. - Clontarf and Sandmount - 10 minute D.A.R.T. ride - Howth and Dalkey - 25 minute D.A.R.T. ride. There are a set of terms and conditions that guests need to sign up to.